OrchardShare is a community group, run by volunteers who work to conserve and maintain orchards to supply locally grown apples around Bath, UK. Come along and help us look after our beautiful orchards. At this time of year we have pruning to do. We will be working at different orchards as required. Saturday 9th February: Northend, 1.30pm. Pruning. Saturday 9th March, Bathampton, 1.30pm. Pruning. Check our posts on twitter or facebook for further details, or contact Tim: timjbaines@yahoo.co.uk or 07886 248147. See How To Find Us for details of where to meet. Bring strong footwear, and working gloves if you have them. Work sessions are normally 3 hours. We'll have a break in the middle, so bring something for a picnic lunch. We usually have tea/coffee (and sometimes cake!) available. We may be able to reimburse your travel expenses. Sessions may be cancelled if the weather is bad. Contact Tim if in doubt. This year we've been successful in gaining funds to help our work. Wessex Water's Conservation Foundation has just given us funds to buy some new tools. As we get more volunteers we need things like long-handled apple pickers in the autumn and loppers for pruning in the winter. The money will also contribute to volunteer expenses and help us to buy some new trees - many of the trees in our orchards are starting to age, so it's good to regularly plant young ones. This builds on the money that the Naturesave Trust gave us in last spring - we have some shiny new pruning saws and secateurs thanks to them. We have lots of our delicious local apple juice for sale, in 75cl bottles. For details of how and where to buy our juice, contact Tim: timjbaines@yahoo.co.uk or 07886 248147. 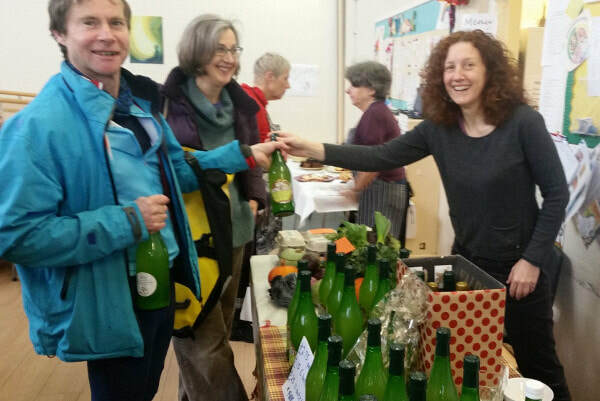 Happy customers buying our apple juice at Bear Flat Christmas market.